The GAO’s annual report recommends action be taken in order to reduce, eliminate, or better manage fragmentation, overlap, and duplication of programs and their goals in order to achieve costs savings or enhance revenue. In their first three annual reports from 2011-2013, opportunities to reduce, eliminate, or better manage fragmentation, overlap or duplication; achieve cost savings; or enhance revenue were presented in 162 areas. The GAO also identified about 380 actions that both branches could take to improve programs and save taxpayer dollars. One suggestion includes the elimination of the overlap of 117,000 individuals simultaneously receiving disability and unemployment benefits, which could save between $3.4 billion and $5.4 billion over a ten-year period. 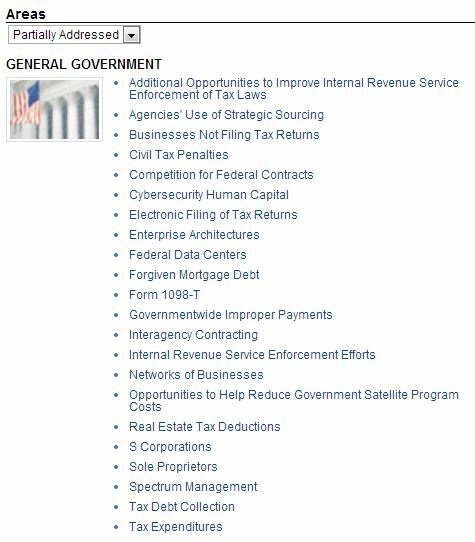 Given that most of these issues specifically affect the IRS, which doesn’t seem to take the integrity its own operations very seriously these days, we don’t think that many of these items will be moved into the Fully Addressed column any time soon. But, let’s give the GAO some credit, unlike the watchdogs of the Department of Veterans Affairs, at least they’re doing something to follow up on the problems that have been brought to their attention while also making it public.